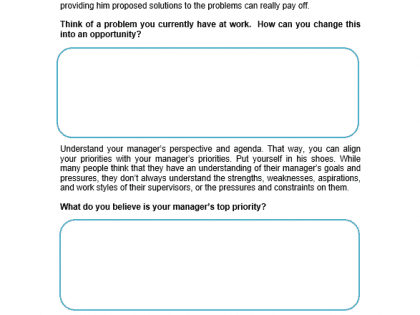 Most of us face one great challenge at work; balancing our own priorities with those of our manager. Understanding what is important to our manager, and knowing how they prefer to work and communicate allows us to work more effectively and provide a greater number of opportunities. 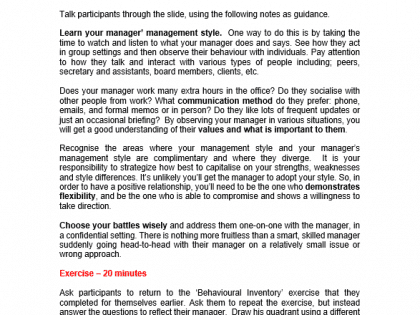 These Managing Upwards training course materials will provide your participants with the tools and techniques required to effectively work with their managers. 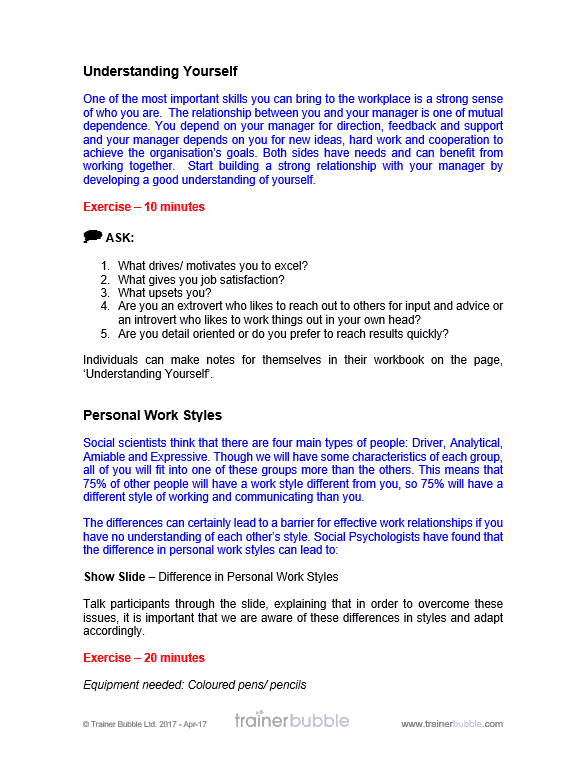 The content will help them adapt their own approach to work in such a way that they can develop a positive work relationship with their manager, which in turn will improve their personal skills and make them a more effective employee. The course will benefit anyone that wants to build a positive working relationship with their manager with the aim of creating new workplace opportunities. These training course materials will provide you with everything you need to effectively develop the skills of people working with managers within your organisation. They will be taken through the key requirements of managing upwards; developing a wide understanding of the tools and techniques required to effectively improve communication and affect change. Why is running this managing upwards training course a good idea? 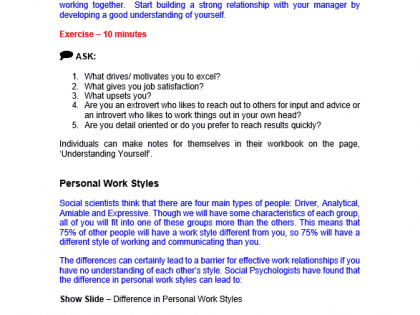 Work effectively with their manager, building their skills and becoming a key asset. 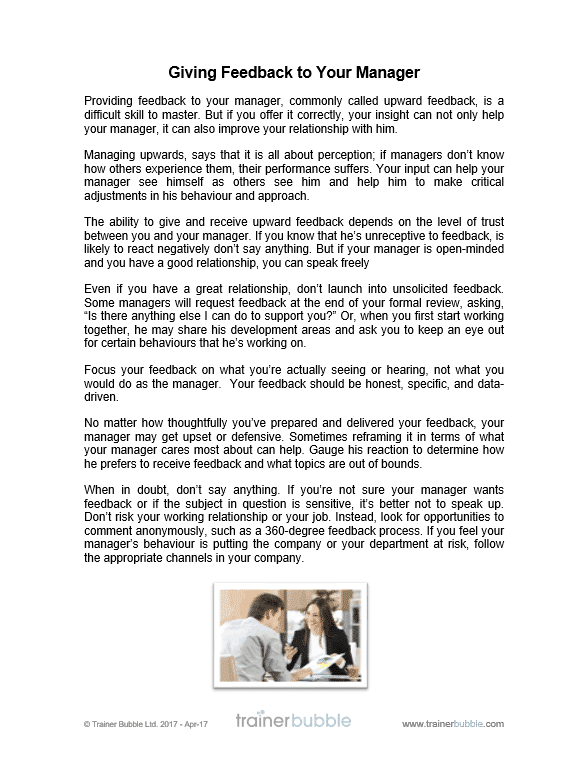 Be more inclined to challenge decisions and work with their manager to find solutions. Appreciate the difficulties their manager faces and support them through them. Develop communication skills to help influence and persuade effectively. 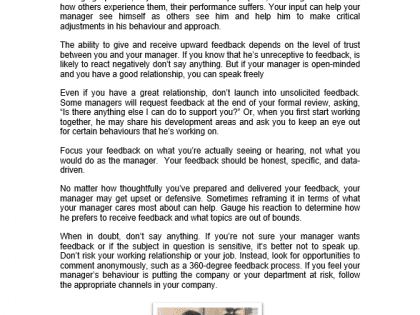 Understand their manager’s work style and how this might affect their thinking. Simply apply core communication skills, for overall organisational success. 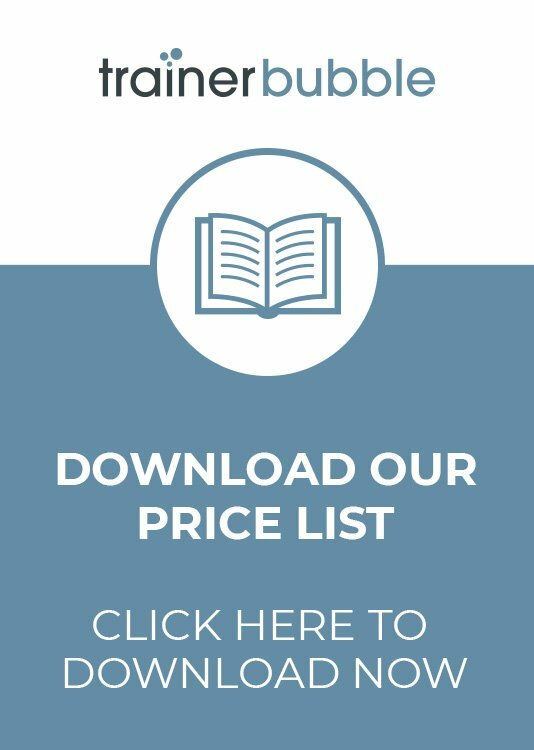 Ultimately these training course materials allow you to improve relations and communication between employees and managers within your organisation. Making them better able to effectively resolve challenges and consequently assist the organisation in meeting its business goals. We all need to be able to communicate effectively with people within our organisation and the way we interact with peers and our own employees should be no different to the way we interact with our manager. 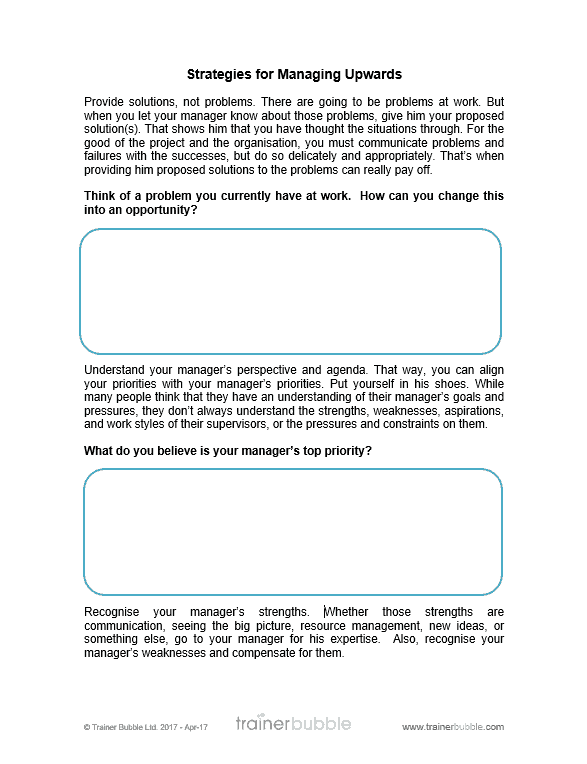 In practice, it can sometimes seem difficult to address your manager and it would be useful to have an understanding of the best way to approach communication with those people in roles ‘above’ our own. Being able to influence upwards will not only benefit your own career, it will also ensure your manager has the support needed to ensure your organisation meets its goals. Managing up is a skill that every employee needs to learn. Recognise that it is YOUR responsibility to build this critical relationship. This attitude will get you the results you want. Understand the manager’ priorities, likes and dislikes, sense of urgency and style of communication and target your behaviour accordingly. In many ways, managing up is simply having the right attitude and realising you have the ability to make things better. 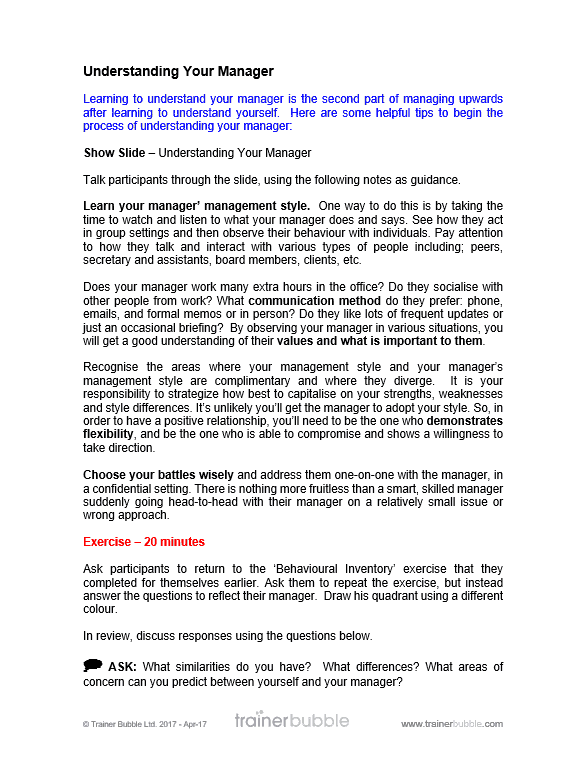 These training course materials will give your participants an understanding of the principle of ‘Managing Upwards’ and will equip them with the key techniques to demonstrate this skill. 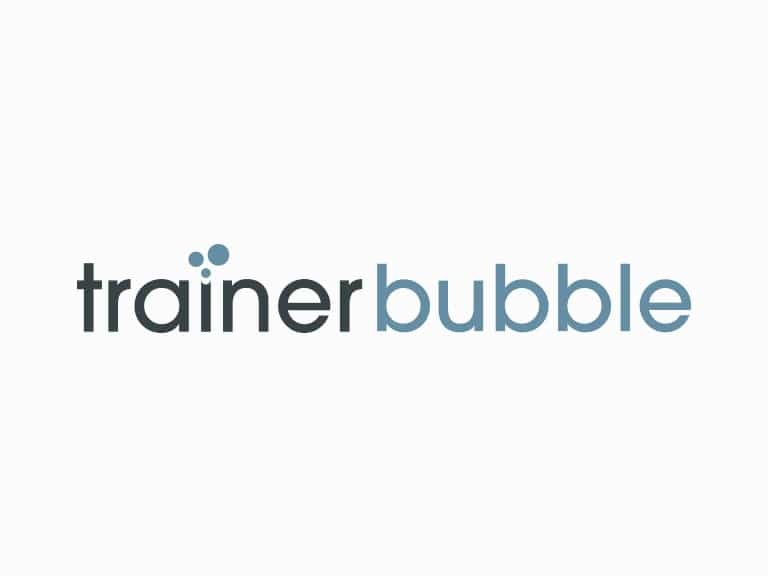 As with all Trainer Bubble training course materials, this course is highly interactive and includes lots of activities, exercises and practice scenarios.